Checking my stats and posting in the Etsy forums had become such an ingrained part of my daily rituals that spending a day without Etsy filled me with a bit of daunting anxiety. To get my cheap fix, I posted a few half-hearted comments in the forums, however still reeling from my passionate rant and reaction to the Etsy Fireside Chats, my thoughts were miles away from wanting to see that big E plastered before my eyes. What has been said has been said and I could not even begin to summarize those feelings again so I will just share the link to the Etsy Forum Post here: https://www.etsy.com/teams/7722/discussions/discuss/17100383/page/1 While perhaps I slightly over-reacted by exaggerating the terms out of their intended context, my interpretation of Etsy's current philosophy towards us full-time artists and sellers only felt clearer throughout the day. The Fireside Chats greased the gears long set in motion allowing the synapses to be bridged and for the first time since starting our business in 2012, muddled emotions turn to clarity and realization that it was high time to move onward to the future and embrace whatever adventures or trials and tribulations lay ahead without focusing on Etsy to provide the platform for our business. Instead of adding a fresh listing for the day to Etsy over morning coffee, I came to Wordpress and spent some time looking through blogger templates, setting up the about page, and focusing a bit on the aesthetics of the site. Nici and I are not bloggers, have never blogged, and only created a few tutorials, so for us this is already the first step to our new adventure. Much like ending a dead end yet long term relationship, the good times and memories present themselves extra vivid and the hardship of the break-up hurts like an arrow through the heart. By mid-day, that ache was overwhelming and my efforts non-productive, so the best solution was to hit my local trails at McDowell on my mountain bike. 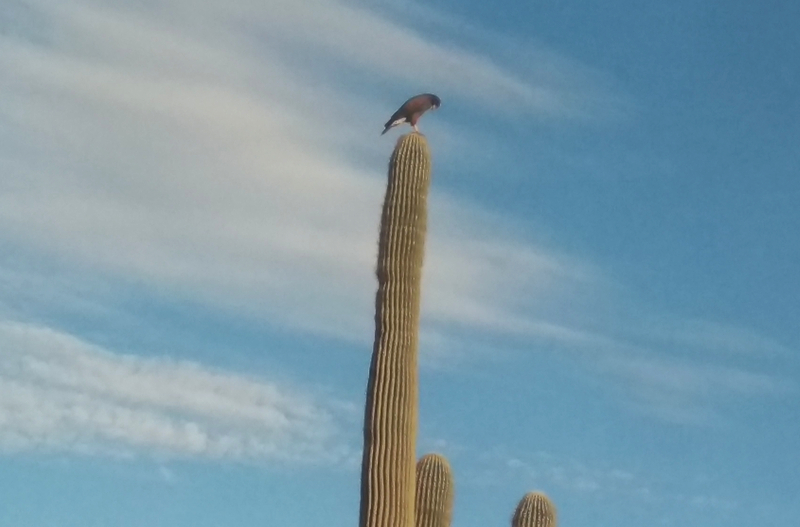 Had I spent the day with titles and tags, I might have completely missed this hawk perched high on a cactus. In that brief moment of natural splendor came a strange sense of relief that actually we were finally free and our best days of creative inspiration are ahead as well as happy days for the wife hubby team who took Etsy by storm with their custom guitar picks in 2012.